Who is your favorite action movie star? Ummmm, Dolph Lundgren…..
Today was one of those slow days at work and in the world of IT that can lead to many weird conversations. To protect the innocent I will use nicknames instead of real names; so the question was posed to our favorite guy to pick on EuroCut (He’s a Banana Republic guy). Now EuroCut is not exactly Ebert when it comes to movies, but we were talking about action movies. What guy can’t talk about action movies? The great thing about EuroCut is that it doesn’t matter if he knows nothing about a particular topic he will participate and say some crazy things; the guy has no fears of embarrassing himself. 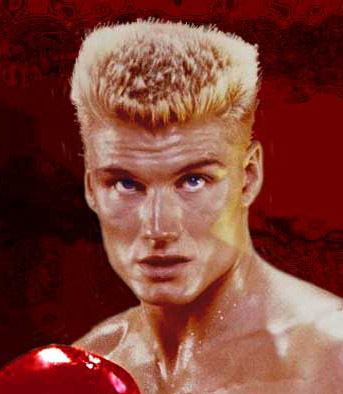 So after deliberation and a whole lot of pressure from the rest of the group to give an answer, EuroCut confidently says…..
Ivan Drago from Rocky IV? Wait…. What? Of course me being the movie watcher that I am, and I mean I will watch any movie; from 4 stars to B-star movies starring the likes of Dean Cain and Lorenzo Lamas. So when this dude said Dolph Lundgren I kind of went into a rant. And of course I had to throw Carl Weathers in the mix fresh off of my last posting, ‘F-A-Natic Fridays – There is no Rocky without Apollo Creed…’. I would definitely say Carl Weathers before Dolph Lundgren. To our shock Dolph Lundgren has made 51 movies!!! Who in the hell is signing up Dolph for all these movies? I mean they are all straight-to-video, b-movies; but still…. I would have never thought he put in that much work, he was doing something like 3 movies a year. You figure that he has to be getting something like $50 – $100K for these movies and is living comfortable, I fund myself having a lil more respect for the man’s career. Not a WHOLE lot but a lil, HAHA!!! If your curious or just bored here is Dolph Lundgren’s website; http://www.dolphlundgren.com/ . Come on man, HE JUMPED OVER A MOVING CAR!!!!! F-A-Natic Fridays – There is no Rocky without Apollo Creed…. Then I get messages from seemingly decent and intelligent people who offer things like: @BrooklynAvi : Guns should only be banned if violent crimes committed with tomatoes means we should ban tomatoes. OR @nysportsguys1 : Drunk drivers kill, should we ban fast cars? The Pianist – It was alright, i mean, seeing someone gradually driven to almost prehistoric type of existence in the wreckage of the Warsaw ghetto. As w/ most of Polanski’s films (one of my favorite directors), it’s a character study, and I think it’s well done on the technical and character building front. The main character is not an action hero, he’s not a genius, he’s not a hunk. He’s a normal guy, thrown into a situation that would drive most people over the edge. That’s what I like about Roman’s films. What would I do? Here there is no question of the sanity of the protagonist, what he perceives is indeed very real – he’s deep in the heart of German-occupied Poland and things are getting real ugly. I often have a hard time w/ a lot of WWII movies in their depiction of the Nazis, basically as a monolithic group of inhuman monsters one and all, and this film does tend to have one despicable act after another rolled out for the viewer (Think that was shocking? Well watch THIS! Think that was gnarly? What about TTHHISS! baM!) to cement the fact that nazis=pure evil. However, the fact that it’s centered on the Warsaw ghetto, one of the historically fiercest fronts in the Nazi Vs Jew lore of the period, makes it a little easier to swallow as the monstrous atrocities stack up. A Nazi near the end is depicted as more than a soulless ghoul, and I have to say that quite surprised me. Then again, Polanski himself a native of Poland, literally lived thru the Holocaust. How could I ever truly know what it was like? I just know that I have played thru enough WW2 games killing evil nazis, and seen enough WW2 movies about evil nazis, and endured enough invocations of Godwins Law during the silliest of internet arguments to make me wonder if the timeworn given of the seeming mass-demonic possession of the German army during the period was perhaps just a little over-hyped. If anything, it’s just terribly cliche and becoming more groan-inducing as time goes on. Nope, instead of believing numerous sources this guy preferred to believe the opinion (with no facts to back up) of a few people aka NUTBAGS. So what do we do when people prefer to believe the non-factual rantings of nutbags?